The official currency of Myanmar (formerly called as Burma) is the kyat. It has the currency sign of K and the code of MMK. The first kyats were of silver and gold coins. There were no banknotes published during this time. Mindon, a king of Burma established the Royal Mint in 1852. Silvers were minted in denominations of 1 pe, 1 mu, 1 mat, 5 mu and 1 kyat, while the golds were done in 1 pe and 1 mu. A mu is equivalent to two pe and a mat is to 4 pe. The coins were printed with the Royal Peacock Seal – which the coins got their names. At the back of the coins, it contains the mint date and the denomination. In 1860’s and 1870’s, different coins were circulated in lead, tin, brass and iron. For the second kyat, no coins were distributed. When Japan occupied Burma (Myanmar) in 1942, rupee became the currency. A year later, the kyat was reintroduced with the kyat being divided into100 cents. The Burma State Bank issued banknotes for 1, 5, 10 and 100 kyat in 1944. After the end of the war, the rupee was once again issued. During the time of the third kyat, coins were circulated in denominations of 1, 5, 10, 25, 50 pyas (equivalent to 200 pe) and 1 kyat in 1952. Gradually, the coins stopped circulating, until 1999 when new coins were introduced with denominations of 1, 5, 10, 50 and 100 kyats. The banknotes were issued by the Union Bank of Burma in 1953. They were similar in design with the rupees issued before. Three years later, 20 and 50 kyats were added. However, in 1964, the 50 and 100 kyat notes were demonetized. A year later, the People’s Bank took over the productions. The Union Bank of Burma once again took hold of the responsibility of issuance in 1972. Through the years there were a lot of new notes being circulated in the country, and many were also demonetized. When Burma changed its name to Myanmar in June 20, 1989, new notes were being issued and old notes were demonetized no longer. Instead, they just let them endure inflation and “wear and tear”. 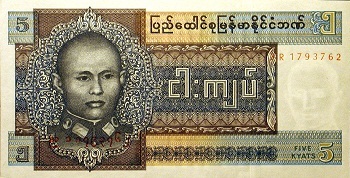 On March 1990, 1 kyat banknotes were issued and were added by 200 kyat. Four years later, 50 pya, 20, 50, 100, and 500 kyats were issued, and on May 1995, new 5 and 10 kyats were tendered. In November 1998, 1000 kyat notes were being circulated. By 2004, 200, 500 and 1000 kyat notes were reduced in size, for the uniformity of all note sizes. In October 2009, 5000 kyats were issued. As of February 20, 2011, the exchange rate of dollar to kyat is 1USD= K895.